There’s a very good reason why Australia’s Gold Coast remains such a popular holiday destination, both with Australians themselves and with overseas visitors. It’s because it’s got that perfect mix of relaxation and sophistication, beaches and bush, family-friendly facilities and luxury. And it’s for these reasons that more and more people are choosing holiday apartments on the Gold Coast, knowing they will have the freedom and flexibility to enjoy it all. If you’re planning a trip to the Gold Coast, you really can’t go wrong, but here are a few suggestions to make your holiday perfect. For starters, don’t feel you have to book a hotel to enjoy a luxury break. Gold Coast suburbs such as Broadbeach are home to amazing resorts, offering stunning one and 2-bedroom apartments that won’t break the bank. One such resort is the Phoenician. 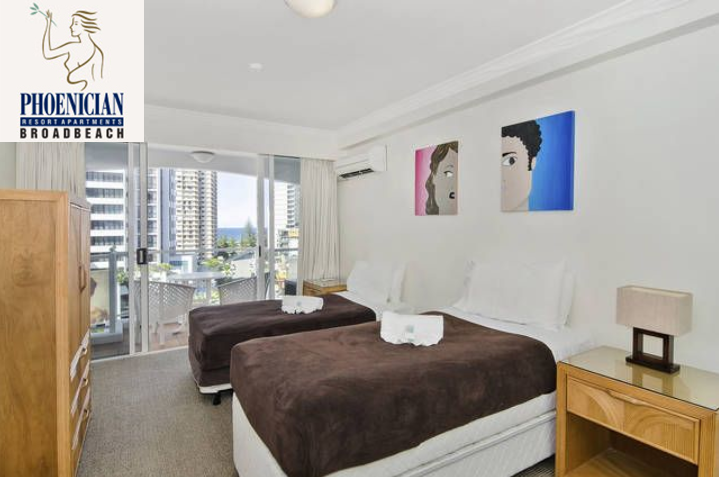 The AAA 4-Star rated Phoenician Resort is superbly placed to enjoy everything the Gold Coast has to offer, being just walking distance from the patrolled beaches, restaurants, cafes, parks and shops, as well as Jupiter’s Casino and the Gold Coast Convention Centre. This is such a great location is you’re keen to take in a show while you’re there. Another plus from my point of view is this; while you can easily get to the theme parks if desired, you’re not next door! Once you’ve exhausted the kids, you can jump back in the car and head back to the peace and privacy of your luxury apartment. The Gold Coast benefits from around 70km of coastline and a huge network of navigable waterways so, whether you love the serenity or an adrenalin boost, there’s a water activity for you to enjoy. But if the closest you want to get to the water is the resort pool, that’s easy too! The Phoenician Resort has two pools – indoors and out! There are also spas, a sauna, gymnasium, games room and wonderfully shady barbecue spots to enjoy. The resort is designed to ensure you can enjoy peace and privacy in your apartment. The one and 2-bedroom apartments have their own private balconies, as well as spacious living areas, queen-sized bedrooms and fully equipped kitchens. Perfect for couples or singles, the one-bedroom apartments also include a double sofa bed for guests, while the 2-bedroom apartments feature a queen bed, twin beds plus a sofa bed, so you can sleep up to six. 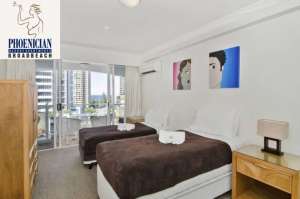 If you’re thinking of booking holiday apartments on the Gold Coast, it’s probably time to get onto it as summer is fast approaching and there are lots of events being announced. In fact, there’s rarely a week goes by on the Gold Coast without some fabulous event to go to. There’s something for everyone, too, from Opera in the Park, to major international sporting events, music festivals and, of course, the very famous V8 Supercars. To get the most out of your trip, with money left over for the treats, take a look at the special deals at the Phoenician Resort, by visiting www.phoenician.com.au and clicking on Specials. Currently the resort is advertising hot deals for October, November and Christmas.